Recommended! Check out the demo to get a feel of what you can do with HomeKit. You can run the demo app from the root of the project by typing npm run demo.ios. As mentioned here, HomeKit is a framework for communicating with and controlling connected home automation accessories that support Apple's HomeKit Accessory Protocol. HomeKit apps enable users to discover compatible accessories and configure them. Users can also create actions to control accessories (such as a thermostat or lightbulb), group them together, and trigger them by using Siri. HomeKit objects are stored in a database residing on the userâ€™s iOS device, which is synchronized over iCloud to other iOS devices. 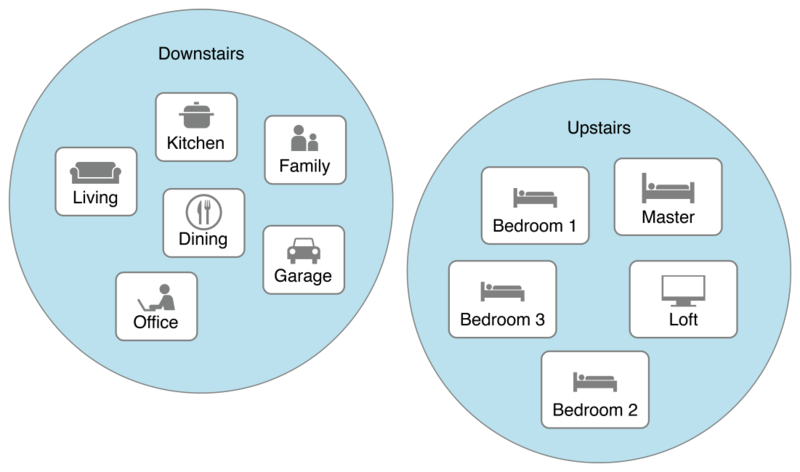 HomeKit supports remote access to accessories, multiple user devices, and multiple users. HomeKit also handles security and privacy for you. This plugin gives you a dead-simple interface into HomeKit's SDK to manage homes, rooms, and zones, and assign accessories to those homes or rooms. Anything beyond that can be done as well, but you'll need to interact directly with the HomeKit SDK. Don't worry, we'll explain how that works and it's easier than you might think. You may wonder why this plugin doesn't expose the entirety of HomeKit? Mainly because it's huge and everything beyond the parts exposed by this plugin really depends on the type(s) of accessories you own. So that would mean we'd produce a lot of untested wrapping code while using the raw SDK isn't that different anyway. Open your project in Xcode, go to Targets, then enable HomeKit. This needs to be done only once, unless you run tns platforms remove ios & tns platform add ios of course. 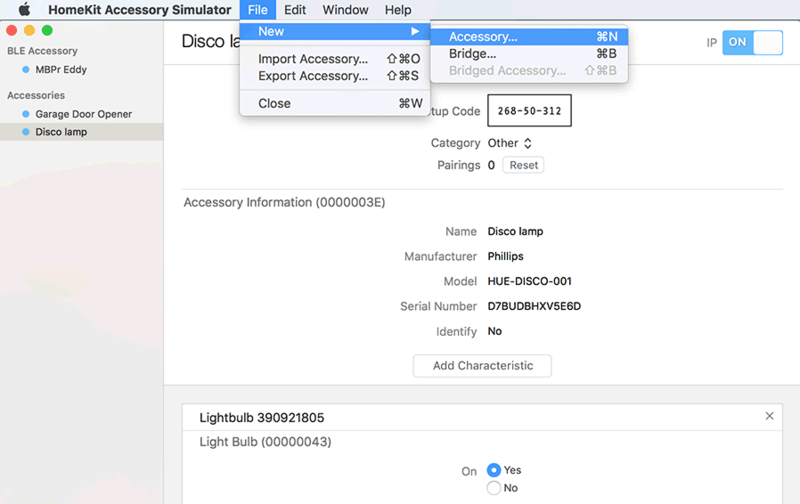 Download the HomeKit Simulator which is now part of the Hardware IO Tools. It's a super convenient way to test your HomeKit-powered app. The HomeKit plugin wraps the native iOS HomeKit SDK classes to make it more convenient for you to work with them. The API functions further below use the types listed in this section. Note that you can skip this section and just look at the TypeScript .ts.d files shipped with this plugin. If you use a decent IDE like VSCode or Webstorm/Intellij you will get autocomplete, etc based on those definitions. Sounds a bit overwhelming? Just look at the demo app as it has all those bits configured. It's a non-Angular TypeScript-powered NativeScript app you can copy snippets from. Note that all of these API functions use Promises so their .then() will receive a resolve and reject param. The reject will always contain a string with an error reason. Most of the time those error will originate from HomeKit itself. For instance if you add a room with the same name as an existing room to a home. Or if you end a roomname with a character Siri doesn't like. On iOS this will always return true, on Android false. So if you already have some other convenient means to branch your code between those two then don't bother invoking this at all. No init, no glory - ehh, HomeKit interaction. You'll need to pass in a function that will receive updates when anything in the HomeKit database changes so your app can respond to those changes. Accessories may pop up at any time, but by default your app isn't searching for them all the time. It's probably a good idea to add a button to your app's UI that starts and stops searching for accessories as the user will know best when a new accessory can be found. Only new accessories can be found, not ones already assigned to a (room in a) home. Also, when accessories were previously stored in the local HomeKit database and have now been removed then you'll be notified as well (try it, assign one and then delete it in the HomeKit Simulator). I'm not sure how much of a battery drainer searching for accessories is, but it's probably a good idea to allow the user to be able to stop searching for accessories at some point. And it's easily implemented as well, so go for it! Again, quite similar to the others. The only difference is you can only add a room to a zone if it's already added to the home. Which makes sense, right? Right. So that's why you also need to pass the home name when manipulating rooms in a zone. Zones can't have accessories assigned, they're only for grouping rooms together. You first need to assign an accessory to a home before you can assign it to a room. That's why you need to pass the home name to assignAccessoryToRoom. An accessory can be assigned to at most one home (and one room) at a time. If you want to assign an accessory to a different room just use assignAccessoryToRoom.